Cordyceps used to be a very precious and expensive herbal medicine to treat diseases for human. Life Rainbow Biotech has developed a method to ferment Cordyceps (Patent I401032) in a large quantity, therefore making the precious herbal medicine available to animals as natural immunity booster. Several active substances found in the Cordyceps extract are proved to enhance animal health. The most mentioned two are: Cordycepin and polysaccharides. The researchers have confirmed that Cordycepin can disturb virus replication by competitive binding due to its nucleoside analog structure. The Cordyceps polysaccharides can stimulate immune cells and increase the non-specific immunity in animals. 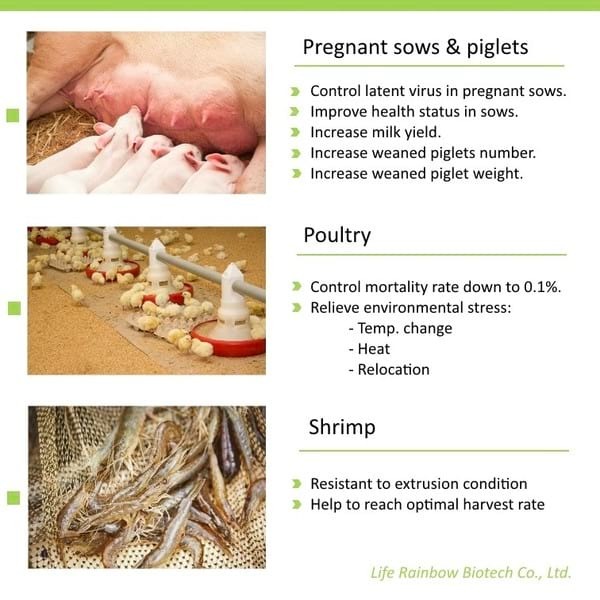 Practically, the products received many positive results in poultry, swine and shrimp farming. Easy-immune® provides necessary support to animals under intensive farming to fight against the pathogen and environmental pressure. Moreover, the quantity of the active substance is measured and guaranteed by the quality assurance section for each batch production.